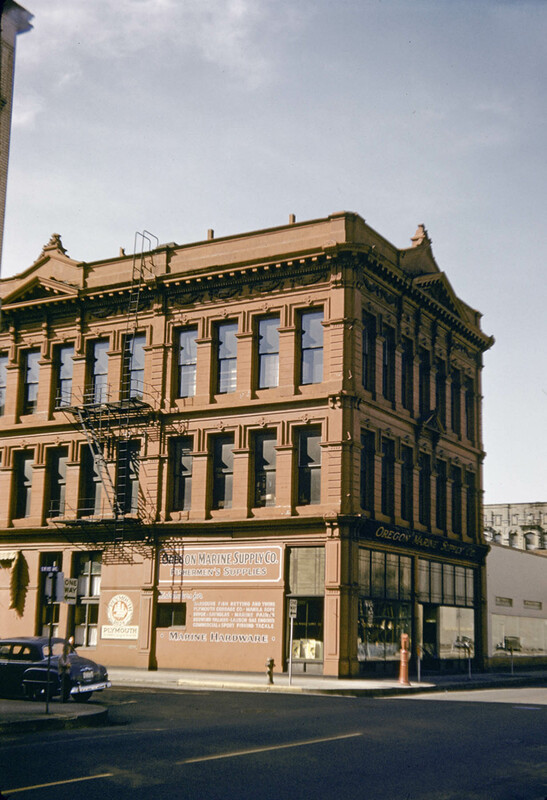 The Failing Building, on the northwest corner of SW 1st and Oak Street, looks much the same here in the 1950s as it did when constructed in 1886. Besides paint and signage, it’s still largely intact today, a fine example of 19th Century architecture with cast-iron details. 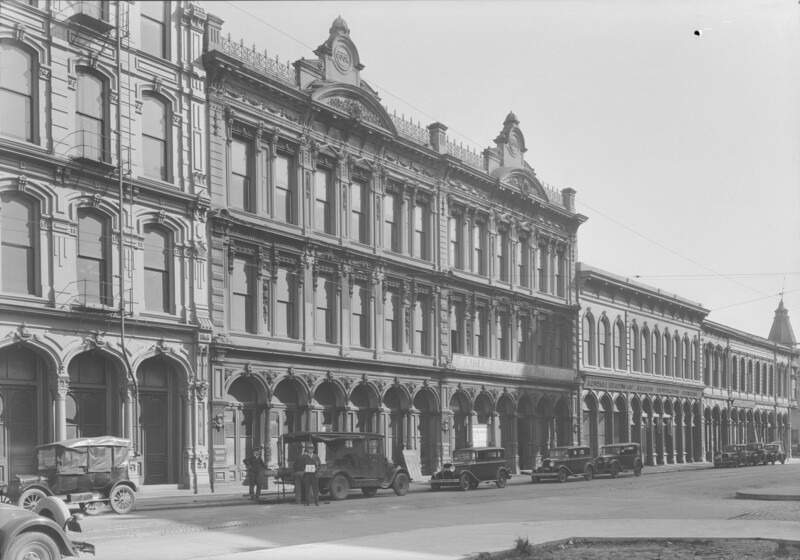 Yesterday’s post showed the intact Union Block in 1955 shortly before its demolition. 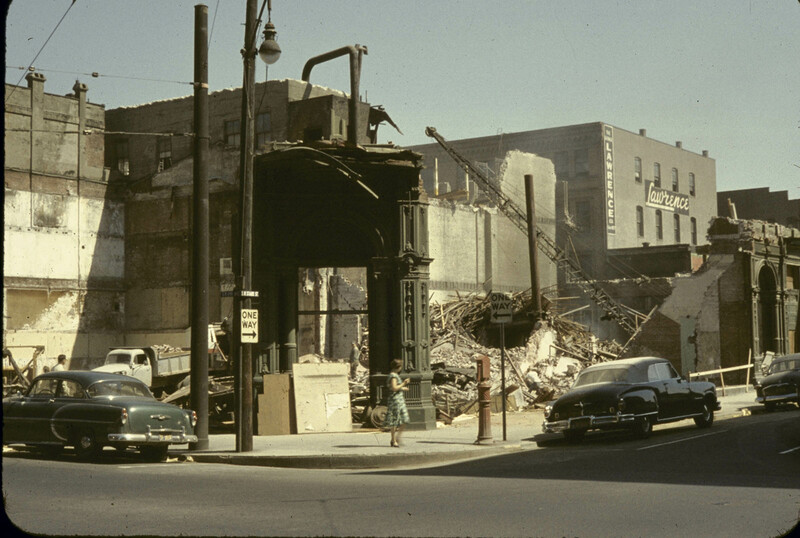 Today’s photo is the same corner, SW 2nd and Stark, during demolition. Not much remains of the staid old building. Here a pedestrian walks past the cast-iron-fronted corner entrance. 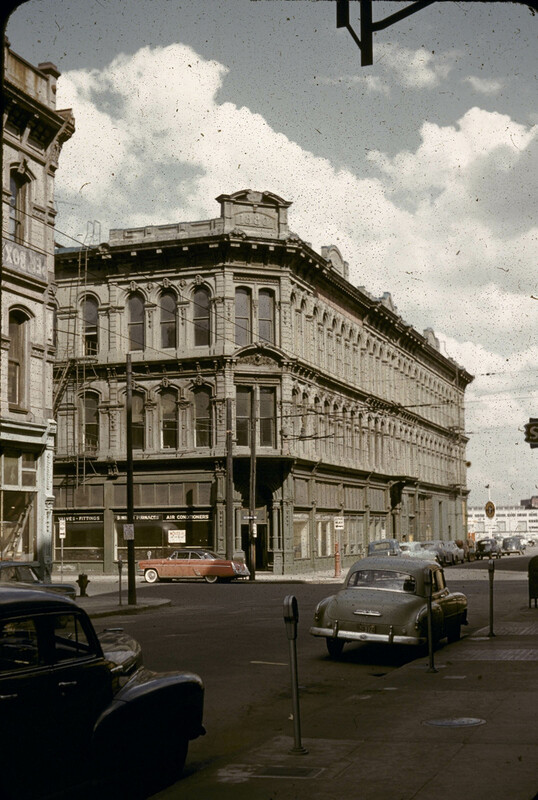 Posted in 1950s, 2nd Avenue, Building, Cast-iron Architecture, Downtown, Stark Street	Tagged Historical Photo, Oregon, Portland, The Lawrence Co. 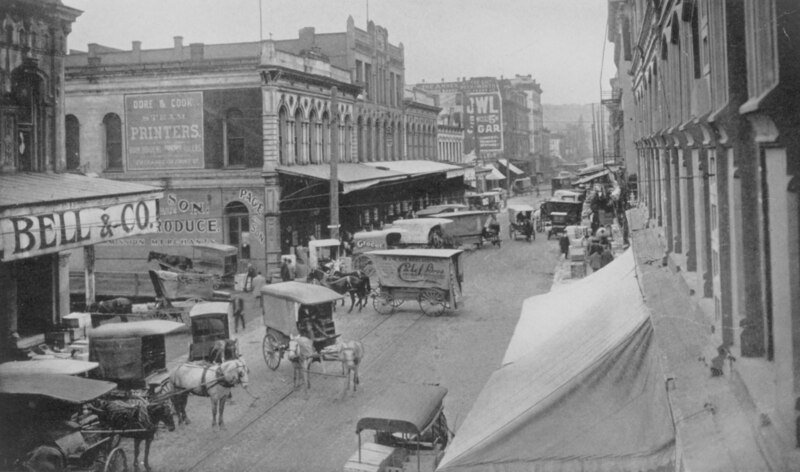 The once-impressive Union Block covered the full block between SW 1st and 2nd Avenues, Stark and Oak Streets. Built in stages between 1879 and 1881, the building featured fine cast-iron pieces from Willamette Iron Works. It was demolished in 1955. This view is northeast across SW 2nd and Stark. 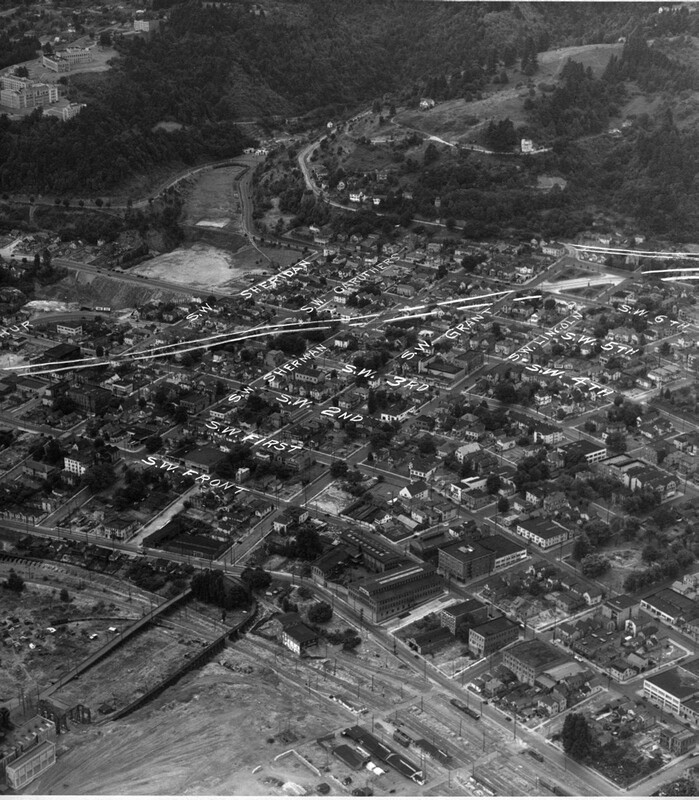 A fantastic aerial photo from circa 1938 showing old South Portland, from today’s Riverplace area and PSU campus through Duniway Park and the Veteran’s Hospital in the distance. 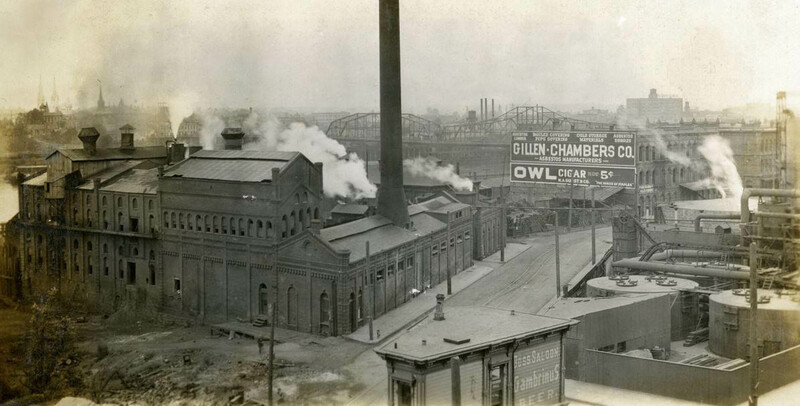 The large industrial complex at lower center is the old Smith & Watson Iron Works, makers of cast iron architectural pieces for many of Portland’s early commercial buildings, as well as fire hydrants that can be found today.